It’s the time of year where we begin spending most of our time outdoors. This is the first time we’ve had a backyard to enjoy. We are deliberately dividing the space into separate zones so we can fully appreciate it. 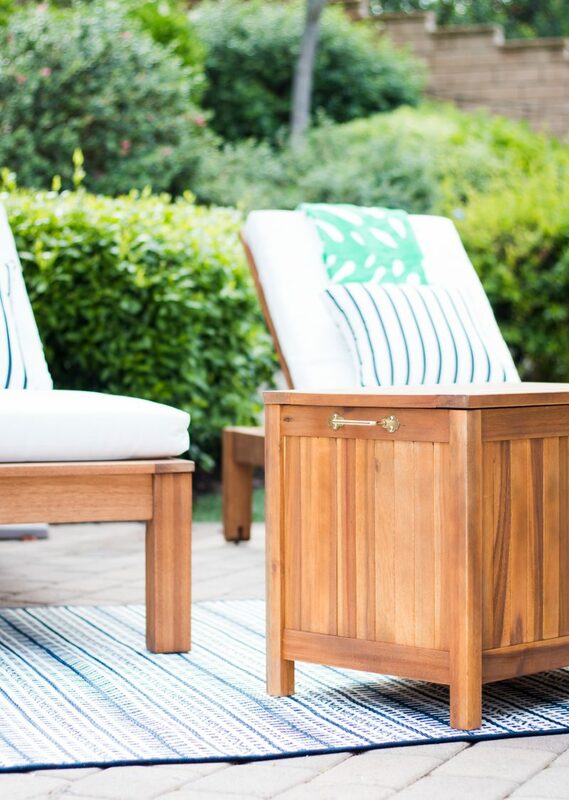 I was thrilled to partner with World Market to help make this lounge area come to life. I’ve been so excited to share it with you as many of the items are on sale. I scooped up this bag from World Market and LOVE it. There are so many of these right now but they are all so pricey. It’s a great one for summer and perfect for me to lug out my towel and magazines so I can relax a bit. I will also be blogging from comfy this spot. Growing up, my mom always made fresh lemonade when we weren’t feeling well. I can remember her making up a bed on the sofa for me and then bringing me an ice-cold glass of lemonade. To this day, each time I make this for my children, memories come flooding back. Hope you’ll try it this summer. 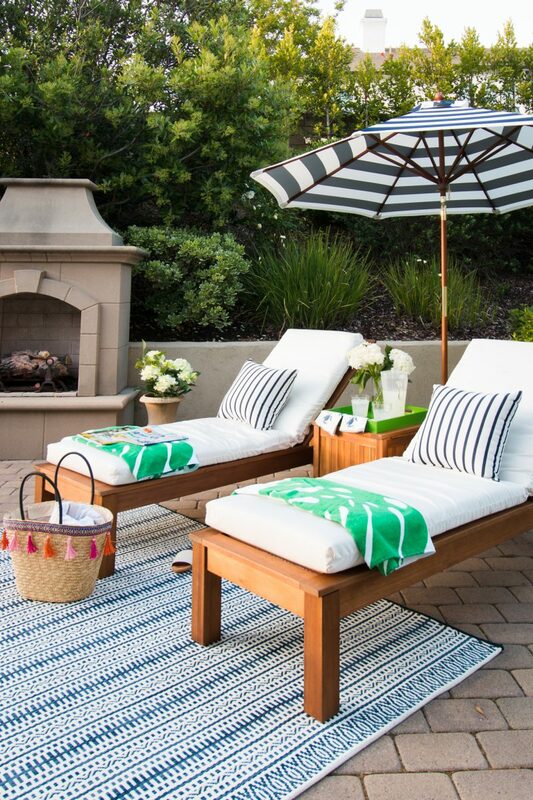 The chair cushions and the striped toss pillows are both made from Sunbrella fabric. That’s important to us so we can brush off any dirt the accumulates. I will also treat these white cushions. Will white get dirty? You bet. But we have always had white outdoors and if you keep them brushed off or put away during the rain, they stay beautiful. 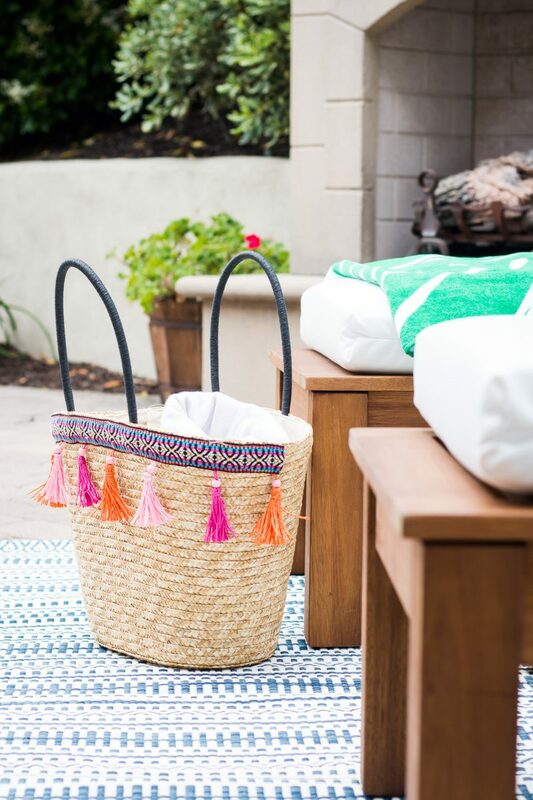 We will also be tossing a beach towel down when we lounge (just like you do at a hotel or pool). I just love how crisp and clean the white looks against the wood loungers. This striped umbrella awning had me at hello. 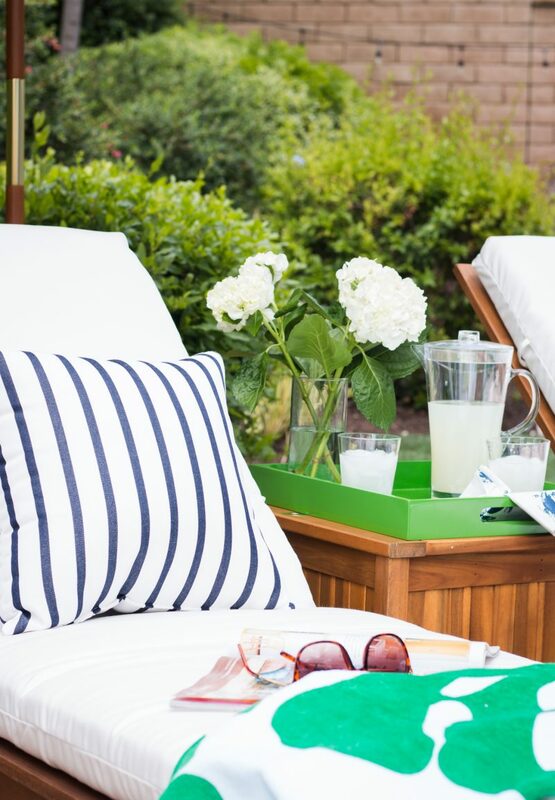 Stripes are my favorite and the preppy vibe was just what I was hoping for with this space. It’s also a nice spot to enjoy in the evening when the fireplace is on. The lounge chairs have wheels in the back so they can easily be moved around. Click on any image for product details. Many of these are currently on sale. Stripes and more stripes! Feel free to mix them as long as they are different in scale. These work with the umbrella because they are narrow stripes. Navy and white just makes me so happy! Hoping this space makes people want to slip their shoes off and just relax. Life is crazy and hectic most of the time. Taking some time to unplug and just be is priceless. And important. It’s something I am learning to do more of the older I get. So I guess there are some perks to aging! 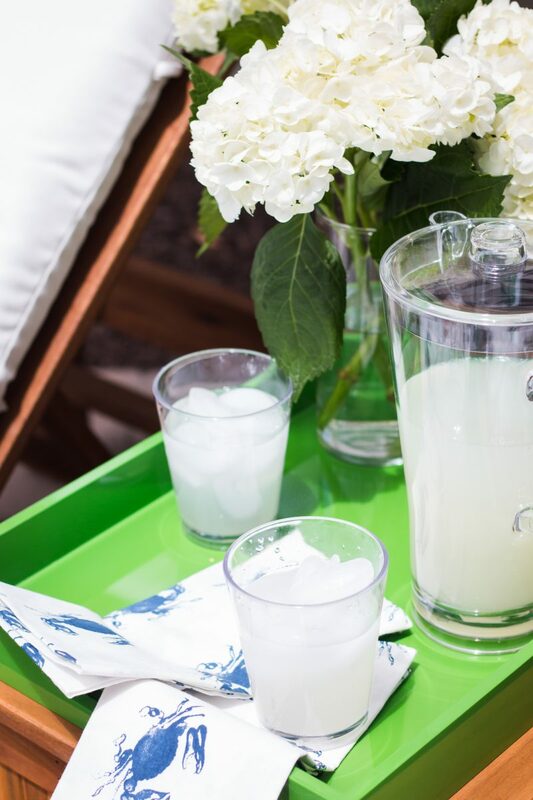 When it’s party time, this side table doubles as a cooler!!!! We are so excited because we love having people over and now I can even keep drinks in here for the kiddos and their friends when they are playing in the backyard. The handles were a pleasant surprise when I opened the cooler. They were tucked inside and create a nice little bit of bling and make the cooler easier to move around. It has a drain in the bottom so you can easily get rid of the water once the ice melts. This is going to be a such an easy way to let guests help themselves when they are over for summer barbeques. We are ready for summer! I keep joking that this area will look great next to our blow-up pool this summer! Yep. No shame in our blow up pool game with dreams of the real thing one day. For now, you can find me here during the golden hour. We have the chairs facing the sunset and it’s a nice way to unwind in the evening. Even my son likes to bring out a blanket and cuddle up with me and talk about his day. I’ll take it! Hope you all have a wonderful day. Let me know if you try my mom’s lemonade. It’s the best! 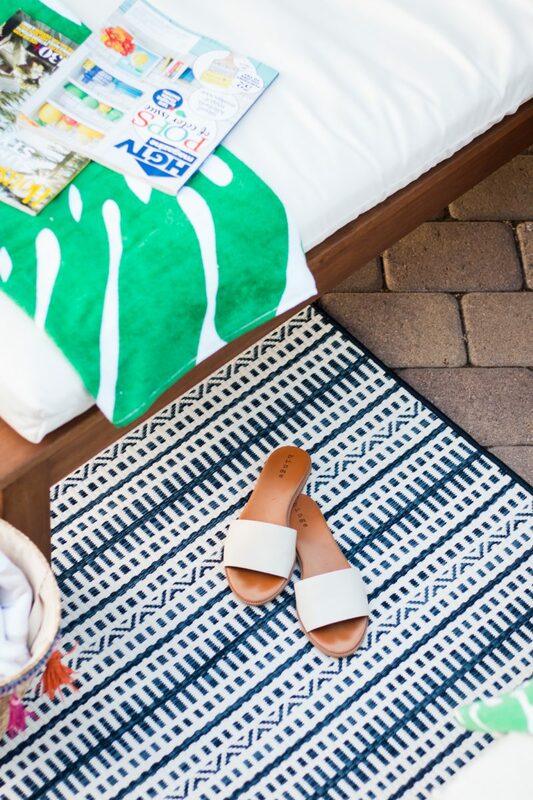 *Proud to partner with World Market on this post. Affiliate links used. Ok, I am packing a bag, getting in my car and headed down now! I want to be sitting right there with you chatting, relaxing and sipping on lemonade. Courtney, your backyard looks fantastic! Beautifully done. Love the stripes! 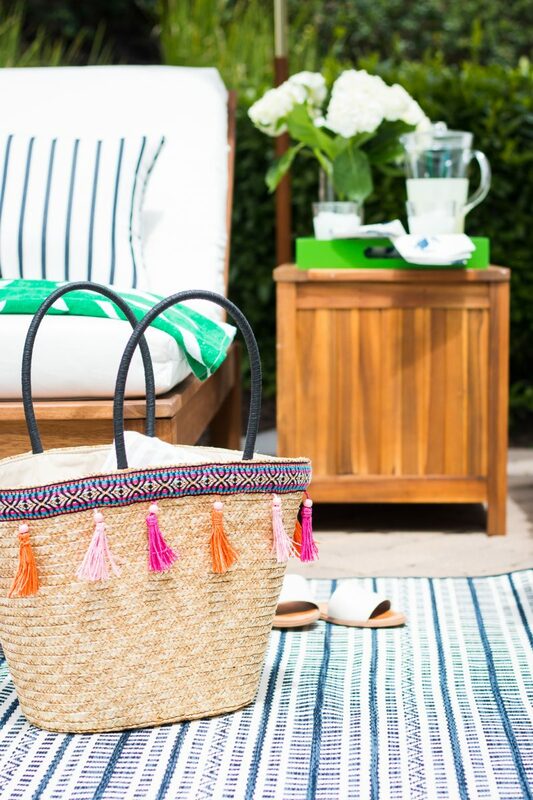 The rug and the green towels ….well I love it all and especially the sweet memory from your childhood of your mama’s lemonade. I can’t wait to visit and enjoy reading in the sun – it was 37° here this morning!!! My mother made lemonade for us in the summer too, but she added one orange – I like how it cut the bite of lemon just a bit. Our California sun is shining for you! Time to get out of the cold! Gorgeous! 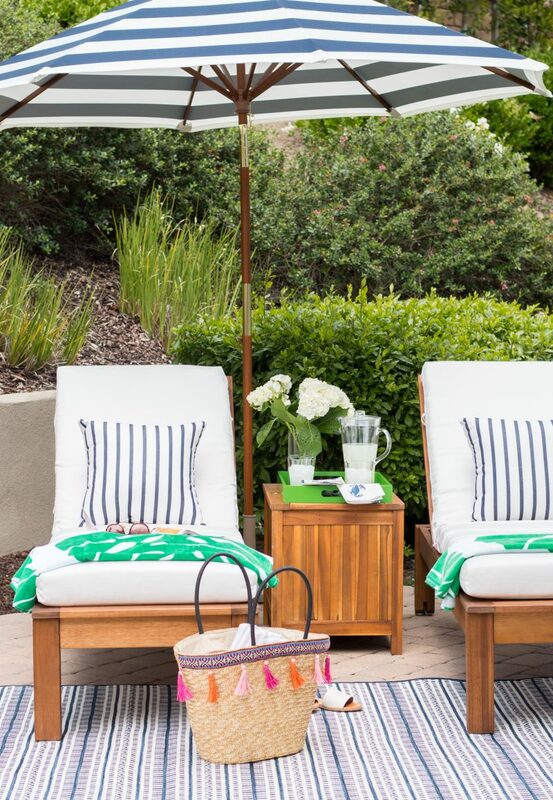 I have sunbrella fabric too and wonder what are you spraying the white cushions with? Hi! 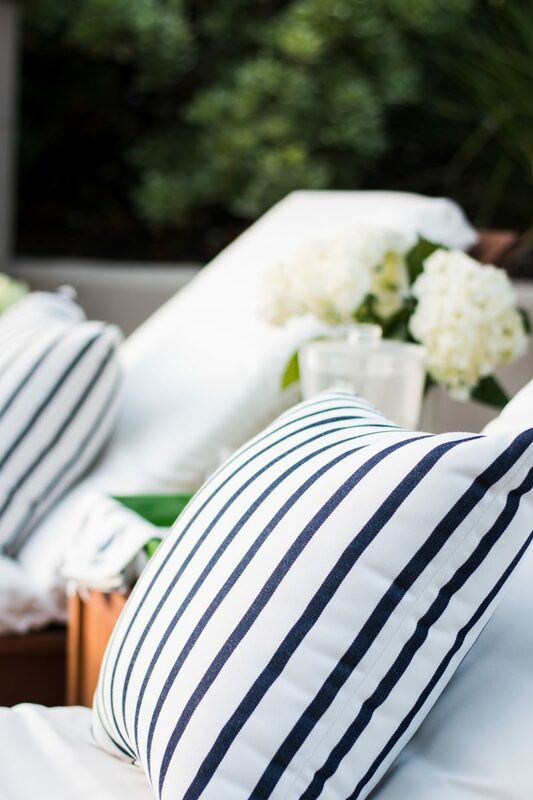 We used a Scotch Guard product on our outdoor sofa cushions. I will use that. . . but always test it first!! Just to be sure. This totally makes me want to dress up my back porch. And I share your love for those blue and white stripes–they just never go out of style. Thanks for sharing this! Are the mosquitos a problem in CA? They’re already making their pesky appearances in TX and sometimes make it difficult to enjoy the outdoors. Hi Michele! Thank you, sweet friend. Fortunately, bugs aren’t an issue. I always tell people we trade having the true seasons (and snow) for no bugs. A perk to missing out on the gorgeous seasons. Such a beautiful, inviting space. I love the rug! Where is that from? Thank you, Kelley! So sweet. That is from Target. What a great space! I need to pick up some cushions for our loungers by our pond. I will definitely check our World Market. What a dreamy space. 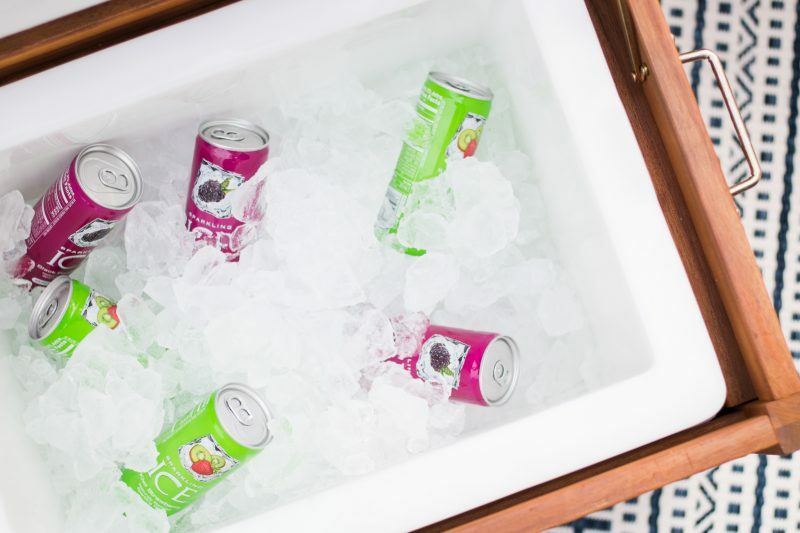 Those coolers! Thank you so very much! Have a great week. What a gorgeous space!!! Can I come and lie there all day please?! Thank you so so much! It was so much fun to put together and we are finding ourselves out there all the time. Thanks for popping in. Have a great day. Beautiful space! Where did you find your gorgeous rug? Thank you so much. That is from Target. Oh wow! I love everything! LOVE the new outdoor space! You used such fun colors and patterns. 🙂 That fireplace is gorgeous! Love the shape of it. 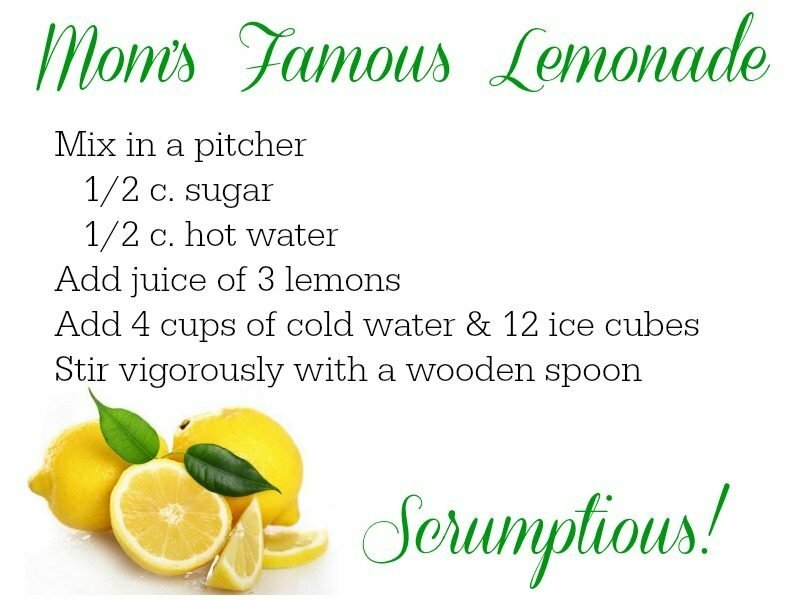 And thank you for sharing your mom’s lemonade recipe with us! Can’t wait to try it.